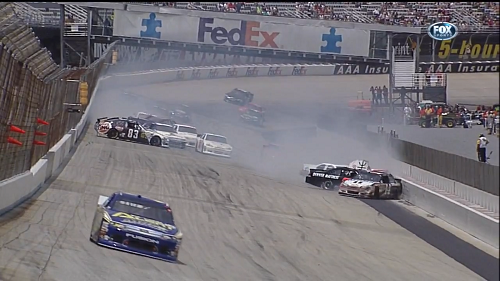 NASCAR has the best crashes and yesterday’s Dover race did not disappoint. Is there anything better than a good multi-car crash (assuming no drivers are seriously injured)? During the Fedex 400 at Dover yesterday there was a great old-school pile up that highlights the good and the bad of close, bumper to bumper racing. The front outside bumper of the number 14 car driven by Tony Stewart made contact with the inside rear of the 83 car. The cars had just entered the back straight after having taken the turn 2 banked sweeper at about 150 mph. Stewart’s car may have gotten a little a light up front from the side draft off Landon Cassill’s 83, or the 83 may have turned in a bit making the contact. Stewart did not have a fantastic qualifying run. Perhaps the car wasn’t dialed in perfectly. Once the two made contact the 83 got loose and went to oversteer. Stewart slowed a bit to allow Cassill rom to catch the car but was then bumped by Regan Smith in the 78 car. From here the first group got sideways and started the mayhem. Coming up fast into the smoke and debris was a second group of drivers. The highlights show there was way to much smoke obscuring the field for the drivers to steer through. In addition, there were cars still in the initial stages of their spins and sliding or rolling top to bottom. Coming out of a turn it is really not possible to even lift off the gas. Every driver knows that will put the car into lift-throttle oversteer. The best the second group could do was to try to hold on and exit the turn before getting off gas and on the brakes. However, the cars piled up back towards the turn and the second group got tangled up. The NASCAR site has good race details, but note there may be a typo in the photo caption that says it was Cassill who got into the back of Stewart. In fact the video shows it was the opposite. In total there were 13 cars involved. For full race recaps and highlights click this link to get to the official NASCAR site.